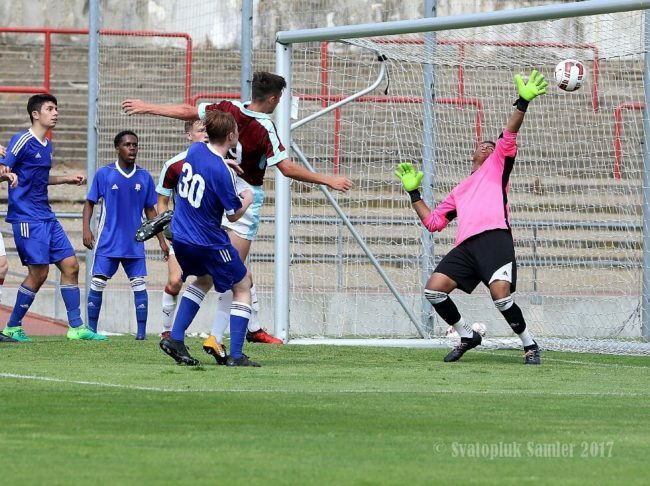 Day two of the Generali CEE Cup saw the action open up, the goals flow and Burnley become the first side to book their place in the semi-finals of the competition. The red hot Prague sun continued to beat down on players and spectators alike. Your reporter came prepared this time, liberally doused in sun cream after ending day one looking like the fabled Rock Lobster of B-52s fame. 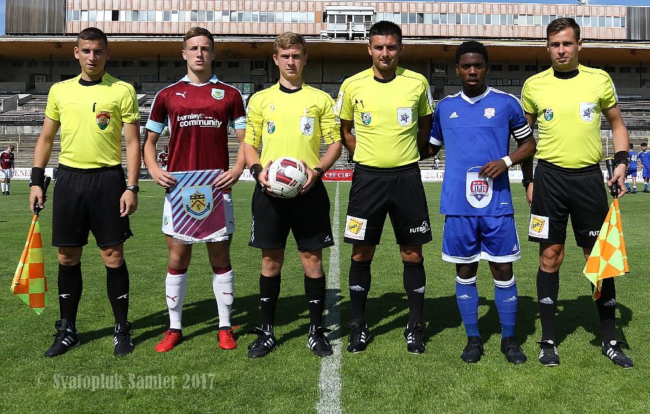 Anyway, the Clarets’ comprehensive 3-1 victory over ProStars FC saw the Premier League’s youth team shimmy and swagger their way into the last four with relative ease. A towering header from Bobby Thomas and, following an equaliser from ProStars’ Joshua Schupak, two goals from Akim Samms put paid to any hopes the Canadians may have had of advancing. After the final whistle, Pies caught up with Jonathan Pepper, the manager of Burnley’s youth academy, who espoused the hard work and dedication of his young charges and the club’s recent Academy upgrade as the reasons for their roaring success in the tournament. After watching Burnley saunter through, the next match between Hungarian side Gyori and Macedonia’s own FC Academy Pandev proved to be almost shockingly physical. One can only assume there were cross words spoken beforehand as, straight from kick-off, there proved to be no shortage of studs-up, turf-wrecking challenges. Neither side held back in a game both teams had to win in order to give themselves any chance of advancement. Typically, it ended in a draw; a fine 2-2 spectacle and real advert for crunching, no-nonsense Eastern European football. The goal glut came to a temporary halt as the game between FC Nitra – who had very nearly taken Leicester to a draw on Thursday – and FK Sarajevo limped to a disappointing 0-0 draw in the Rosickeho Stadium. The real fireworks were reserved for the day’s final encounter in which Academia Sport Team walked right into another 6-0 caning, this time at the hands of Turkish side Altinordi FK. Altinordu arrived at the CEE Cup very much an unknown quantity but a blitz of their Romanian opponents meant they ended the second day as the talk of the town. It all sets up a very finely poised, brutal and unforgiving clash between Altinordu and Slavia Prague – who inflicted a six-goal drubbing on Academia in their first outing – on Saturday afternoon to decide who from Group D will advance into the semi-finals. A number of teams seemed to display nerves on day one, with the goals in shorter supply as the combatants sized each other up and felt each other out… so to speak. All that tentativeness duly fell away on day two so, by right, Day Three should be an absolute blockbuster! Here’s hoping. For now, I’m off to plunge my legs into a bath of cold water and then enjoy another dubiously-named beer in the hotel bar. It’s a hard life, this football writing lark, you know. As the only British publication heading to Prague this week, Pies will have pitchside and press conference access and coverage. Keep an eye on our Twitter and Facebook pages for Joseph’s regular dispatches from the CEE Cup.